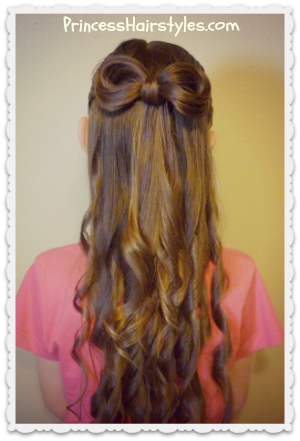 A basket weave braid, and a bow made from hair! 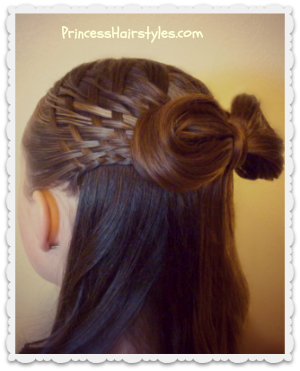 If you have been following our hair blog for awhile, you may recognize this weaving technique. It is actually from one of our all time favorite styles that we posted way back in 2009, and something that we still use quite often for special occasions. 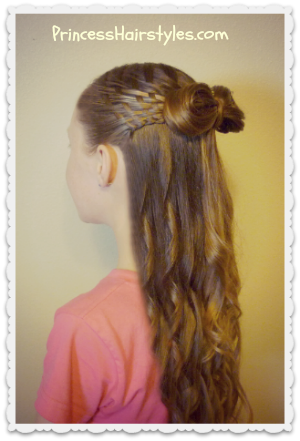 Every time the Princess wears this type of weaving in her hair, she always gets lots of compliments and attention. I'm sure you will too! In the past when she has worn this woven half ponytail, we have found that the weaving does not hold up very well throughout the day. In our video tutorial below, we show how to add a braid underneath the weaving to help remedy this problem. 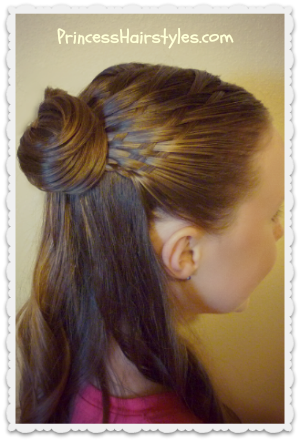 The Princess actually wore this hairstyle to an event a few weeks ago, and the style held up great with the added braid! Weaving tool. (A topsy tail, large craft needle, or design weaver will work.) If you do not have any of these objects, it is possible to do the weaving without... but it is more difficult. The tool we used to weave her hair is called a "Design Weaver" & is made by Scunci. We purchased ours at Walgreens.